Boat Description This new concept in speed, performance and layout was developed from the fast patrol boats of the North Atlantic where treacherous seas continually test a vessels seaworthiness. There can be no compromises with these boats and the Albin 40 North Sea Cutter is no exception. At the heart of this Cutter you will find the latest development in design. The hull`s sharp entry, allows for a smooth ride in pounding surf and overall engineering enables easy handling in head, following and quartering sea conditions. The design concept of the Cutter class sets the Albin 40 North Sea Cutter apart from conventional cruisers in terms of both seaworthiness and performance. This is a `no nonsense` vessel for the Yachtsman who respects high performance under the most adverse conditions at sea. Dependable, twin diesel engines are standard. Capable of speeds to 25+ knots depending on engine choice. The Albin 40 North Sea Cutter is remarkably stable and maneuverable. Cabin Accommodation Once youve boarded the 40 North Sea Cutter, youll find an interior layout that is far from that of a conventional yacht. For example, the owners stateroom is located forward of the main saloon. Its queen berth is on the centerline and features wide walkarounds. The stateroom also features an ample head, a separate shower, and plenty of storage. The main saloon is bright, uncluttered and very accommodating. An L-shaped settee is opposite a well-equipped galley. Toward the stern, the aft cabin with its own private head is a versatile space. It can be a den or library for liveaboards, or it can expand the utility of the saloon. Obviously, it can also become a guests stateroom or a bunkroom for children. The aft cabin opens to a generous cockpit. A few steps up is a sundeck, and up several more steps is a bridge with a second helm station. The Albin Cutter is the newest concept in performance and luxury. For the Yachtsman who wants more than another cruiser, This is the one to consider. 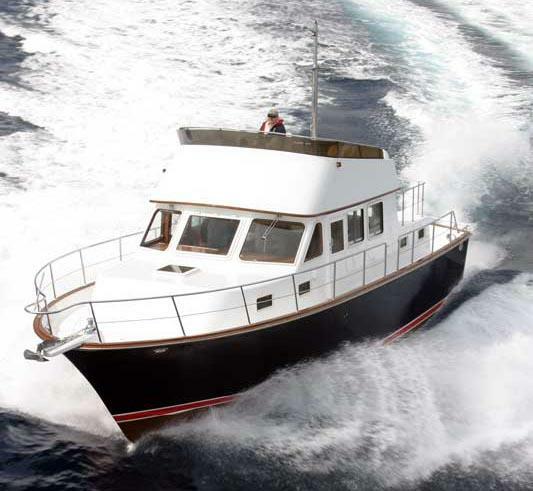 Take the helm of the Albin 40 North Sea Cutter and you take command of the finest vessel on the market today. Dry Weight 25000 lb approx.